I've Been Trying This Technique For Years And I'm Still Not Getting Any Faster! any part of your stroke. The human body needs to perform an action about 10,000 times before it starts to feel natural and automatic. If you're making a change to your stroke technique that's roughly six sessions worth of swimming (counting each arm stroke). ...but don't persevere too long! If you're trying a stroke modification and it isn't giving you a noticeable benefit after six to eight sessions then you need to do something different. Maybe you're trying to achieve too much at once (breaking things down into smaller steps might help) or you need a different drill or another visualisation. A classic question we get from many swimmers is: "I've been trying this technique for three years and I'm still not getting any faster! When will it work for me?" - Sorry to say, it's never going to happen. You're never going to wake up one day and be a super fast and efficient swimmer focusing on the same things for months (and years) on end without any progress in the meantime. You desperately need to break out of that rut and try something different. It could be you need to introduce more fitness training and open water skills to your training mix. Or perhaps the ideal stroke technique you have in mind is simply the wrong one and you need a new vision of stroke perfection. The very best way (if you're in the UK) is to see a Swim Smooth Coach who will give you a clear picture of the changes you need to make. Don't be afraid to really shake things up this winter and try a different approach to your swimming - it could exactly what you need both mentally and physically to break you out of that rut. Picture the scene: You're finishing your triathlon swim leg in perfectly flat water conditions, there's excellent visibility, no currents or tides, and a huge swim finish banner to swim towards. Easy to swim straight into shore? You've probably stood on the shore and watched swimmers at numerous races yourself but it's only when you accelerate the footage like this that you see what is truly going on and how swimmers are adding many hundreds of meters to their swims by constantly going off course. Are you doing this? If you struggle to transfer your pool times across to open water or have a bad race performance and are not sure why, this is almost certainly the reason. This footage was shot in perfect conditions but if the water is rougher or sighting is more difficult, things get a lot worse and more and more swimmers fall foul of this problem. If you've read our new book you'll understand how highly we value open water skills, such as the ability to swim in a straight line. It's all very well focusing on improving your stroke technique in the pool, perhaps chipping a few minutes off your 1500m time but if you then give away five minutes by constantly moving off course in an open water race what's the point? That's why we strongly recommend that you keep practising your open water skills all year round, working on techniques such as the ability to swim straight, sighting efficiently and drafting confidently in the pool over the winter. 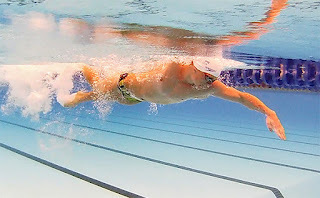 These skills can improve your swim splits by 1, 2, 5 or even 10 minutes per km in extreme cases. Many swimmers (and coaches) tell themselves "swimming is all about technique" but the truth is that there are many things that constitute great technique. Pacing yourself well, drafting effectively, sighting efficiently and swimming straight without a black line on the bottom of the pool are all critical aspects of great technique. And they are worth just as much time for your race performances too. PS. 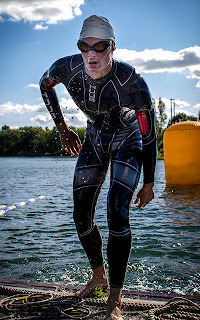 If you're an open water or triathlon coach, please forward this to your athletes to watch. 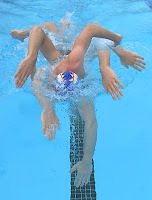 A skill that all great swimmers have is the ability to maintain their stroke technique at racing speeds, which requires strong concentration and great coordination. Here's a simple set that you can use to start to develop this yourself. We just ran it with the Swim Smooth squads in Perth and the guys loved the challenge! At first the 100s will feel very do-able so get into your stroke with a nice rhythm and concentrate on hitting the times as accurately as you can. Obviously as things get progressively faster they become more challenging so maintain your focus on holding your stroke together, not fighting the water. This combination of good pacing with good stroke technique under duress is very powerful for developing you as a distance swimmer. Whilst swimming the set, it can be a good idea to pick a single area of weakness in your stroke and focus on it as things become harder. This could be maintaining a constant smooth exhalation into the water, avoiding crossing over the centre line in front of your head or stretching through your core to keep yourself straight. Don't worry if you are quite new to freestyle swimming, its amazing what you can achieve when you challenge yourself and give this session a good crack. If you find you fatigue quickly, you can shorten the set by swimming 2x 100m at each speed. their stroke technique when swimming quickly. - Use mode 1 set to beep the pace to you every 25m or 25yd so you get pacing feedback during each 100m. - Take one beep rest between each 100m. So finish a swim on a beep and then start the next 100m on the next beep. - If you have the beeper set to beep every 25m then take off 0.25 seconds to speed up by 1 second per 100m. - You might notice straight away that you have a tendency to start too fast over the first 25-50m of each swim and get ahead of the beep before dropping back again. This highlights that developing a better sense of pacing will be critical to moving your swimming forwards.